Haq's Musings: "Occupy Wall Street" Anti-Semitic? From what I can tell, "Occupy Wall Street" appears to be a genuine grass roots movement that stems from a sense of deep dissatisfaction with the way the majority of American politicians of both parties have aided and abetted in the misdeeds committed by the big Wall Street firms. Some of these misdeeds have been laid bare by a number of authors, including Michael Lewis most recently in his two books on the subject. The actions of Goldman Sachs and other big Wall Street firms have led to massive job losses, growing homelessness, and deep concerns among middle class Americans about their own future and the future of this country. A similar situation is now gripping Europe as well. 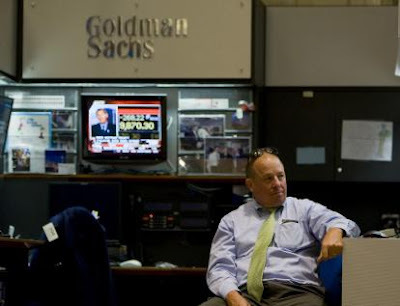 Labels: Goldman Sachs, Jews, Protest, Wall St.
it is wrong to say that all rich people in USA are Jews. And many among the protesters are also Jews. Jews have suffered enough for the last 1700 years. We should let them live a decent life. Every conspiracy theory has a Jewish angle these days. You could also mention how Bill Black who helped clean up the S&L crisis has lambasted the failure to do anything in this crisis. He has done a slew of articles and done interviews. Just google his name and see. Who never heard of Religion to the rescue 8-) They’ll do anything to distract the attention, lets wait and see if it sticks, if it does ? it’ll be a pretty low blow..
Well, the Jews have higher IQs (mean roughly 115). Specifically the Ashkenazi Jews. A visit to jinfo.org reveals that they have 37% of US Physics Nobels, 29% of US Chemistry Nobels, 53% of US Economics Nobels, 40% of US Physiology/Medicine Nobels, etc. They are that smart, so they are well-represented in all the elite professions too. Nothing much to see here, really.